Follow LeGogh on LikedIn for a different look. Follow LeGogh on Twitter for project updates. LeGogh's Instagram for pics of models. This is The Art of LeGogh and my name is Eric Hunter. I am an artist and LEGO® is my medium. I design and build custom LEGO models of anything you desire; from buildings and vehicles to mosaics, sculptures and more. Click here to email me for an estimate! Since I was four years old, I have been building with LEGO bricks; so I have over 40 years of experience so far! I am a former Master Model Builder of nearly nine years at LEGOLAND® California from 2005 to 2013. What a wonderful experience that was! I learned a lot about design and implementation while working there. I had the privilege of designing the world’s-tallest Miniland® building to date; The Petronas Twin Towers model which is the centerpiece of LEGOLAND Malaysia. It is 32.85 feet tall and constructed entirely out of regular-sized LEGO elements. There is almost an infinite number of scales in which models can be created. The first question to ask is roughly how big does the final LEGO model need to be? Common scales used in LEGO® building include 1:50 and smaller (Micro scale), 1:45 (Minifig scale), 1:20 (Miniland scale), 1:8 and larger (Macro scale). Most models can be built at any desired size. If you want a model of a tall skyscraper in your office, it would be Micro scale. A model of an oversized LEGO brick as a tissue dispenser is Macro scale. • Lots of fun for all! Click here to read newspaper articles about my LEGOLAND job-seeking experience. I started building with LEGO when I was just four years old. I got a Universal Building set as a gift from my aunt and uncle. From that point on I was all about LEGO. I did, of course, play with many other toys, it's just that LEGO was anything I wanted it to be. Other toys couldn't really compare! I loved to design LEGO houses of all sorts, even apartment buildings with working elevators! I think LEGO cars were (and are) my favorite LEGO models to design! When I was 21 years old, I decided to build one final, really big and detailed LEGO car to keep on display forever. The Acura (Honda) NSX had just debuted on the scene and I was in love with that car. It was my dream car, so I decided to build a LEGO replica of it as my subject matter. I started with the LEGO Technic Wheel 24 x 43 with Black Tire 24 x 43 as my scale reference. The scale LEGO car model ended up being almost exactly 1:8 scale. Now I had seen some really cool, and somewhat large LEGO models at toy stores in the mall before, but nothing like many of the LEGO models shown in this book! I had never built gigantic sculptural LEGO models before, but I just knew I wanted to, and could, if given the chance and 1,000,000 LEGO bricks! Once I knew I had the real option of building LEGO professionally, I started to design a lot more and more LEGO models at home, honing my skills and learning new techniques along the way. When LEGO Star Wars kits started coming out, I couldn't stop buying them! I was a finalist in the 2003 Master Model Builder Search that LEGOLAND California put on to fill an open Master Model Builder position in their Model Shop. I made it in the last available first round in Orange County, California. I only heard about the competition a few days earlier! Close call. CARLSBAD, Calif., Oct. 21, 2003 PR Newswire - LEGOLAND California will leave no brick unturned in the national search for the next member of the LEGO Master Model Builder team. A dream job on the LEGOLAND Model Builder team has just opened up. The national job search opens on Oct. 30, 2003. The family theme park has partnered with The Art Institutes, America's leader in creative education, as the official host location in each city. After kicking off at The Art Institute of California-San Diego on Thursday, Oct. 30, the official Master Model Builder Search will head to Art Institutes in Washington D.C., Boston, Charlotte, Las Vegas, Phoenix, and Los Angeles before its final stop in Orange County, California. Finalists from each city will be invited to travel to the theme park in Carlsbad on Friday, Jan. 23, 2004 to interview for the ultimate job -- and the chance for the coveted spot as the seventh LEGO Master Model Builder. Candidates will have the opportunity to pre-register on line for an interview at www.LEGOMasterBuilder.com , and then meet face-to-face with LEGOLAND team members when the master model moderators arrive in their city. "Participants will have 2,000 LEGO bricks, and 45 minutes, to create a model. The specific theme of the project will not be announced until the clock starts, so contestants will truly have to exhibit creativity, strategy and calmness under pressure," said Patrick DeMaria, head of the building team and a Master Model Builder himself. "Each city's competition will have a different theme." Currently, six Master Model Builders work their magic at the park, maintaining more than 5,000 models composed of more than 30-million regulation LEGO bricks, and they are constantly dreaming up new creations. The Model Builders' job is to design, construct and maintain the models in the park. As a creative group, Master Model Builders have defied labels. They've studied architecture, sculpture, media design and art history; they've been postal workers, graphic artists and homemakers. They have been special effects technicians who built, then blew up, models for movies; they skydive, camp, play music and travel. They do have two things in common -- they've all been playing with LEGO bricks since they were kids, and they're passionate about their work. People will be able to track the progress of the Master Model Builder Search on a special dedicated Web site, and see photos of the winning models from each city. For more information about the competition, visit www.LEGOMasterBuilder.com. A little less than a year after the Master Model Builder Search, I heard of an available position in the LEGOLAND Model Shop! I was living locally, so I applied. I got a part-time, seasonal, temporary position in the Model Shop at LEGOLAND California back in January of 2005. It wasn't a foot in the door, it was a toenail in the door. I was hired as a Model Associate, which is basically the lowest position in the Model Shop. But I was now a professional LEGO model builder! It was a dream come true and it felt AWESOME!! I couldn't believe I was getting paid to build LEGO models. They hired extra help to complete the Miniland New York cluster refurbishment. The new layout would include a 28-foot-tall LEGO model of the Freedom Tower, designed by William Webb and Glenn Christiansen, two great LEGO Designers. I was part of the model building team for that major project, I was not one of the LEGO Designers on that project, as I was just recently hired. My very first day of work, I gave a little input on the design of the LEGO Freedom Tower, and the idea was used! It even affected to look of the entire model. I felt part of an awesome team from day one! One of my first big designs at LEGOLAND California as just a Model Associate was a custom LEGO mosaic for the upcoming LEGOLAND California Star Wars Days event. It was pretty large - at 8.5 X 5 feet in size - it took 28 gray 48 x 48 LEGO baseplates to complete. That makes this LEGO mosaic 336 x 196 studs in size. A very interesting step in the design procedure on this LEGO project was the fact that it needed to be officially approved by Lucasfilm! My LEGO mosaic design was the main cover art off the [then] current LEGO Star Wars video game. The Pirate Shores area of LEGOLAND was under development at this time and the LEGOLAND California Model Shop was asked to design and build many of the LEGO models to go into the theme park's new attraction. 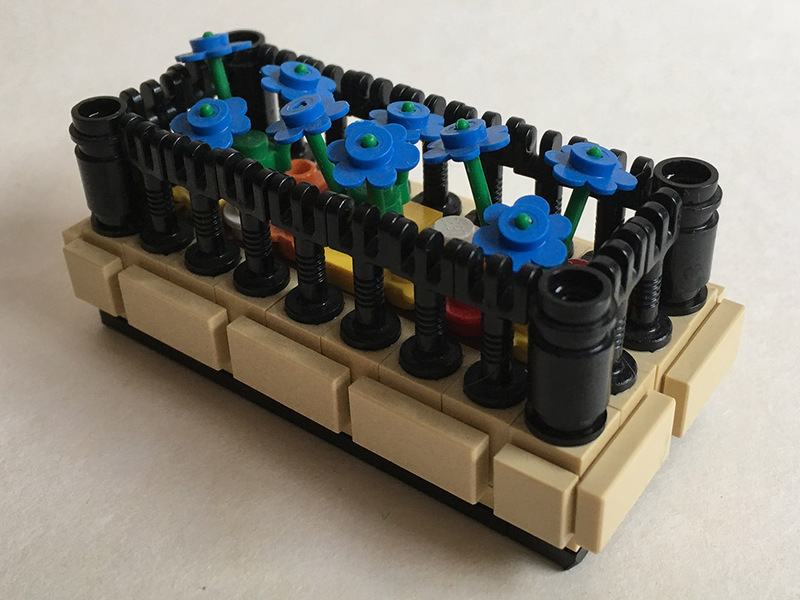 I got to design a small treasure chest business card holder that was given away to clients and vendors as part of a LEGO model gift from the park. MY next pirate LEGO projects were for the Spalsh Battle ride. They were two life-size LEGO people seen at the beginning of the ride. One is a LEGO serenading minstrel and the other is a LEGO buxom wench. 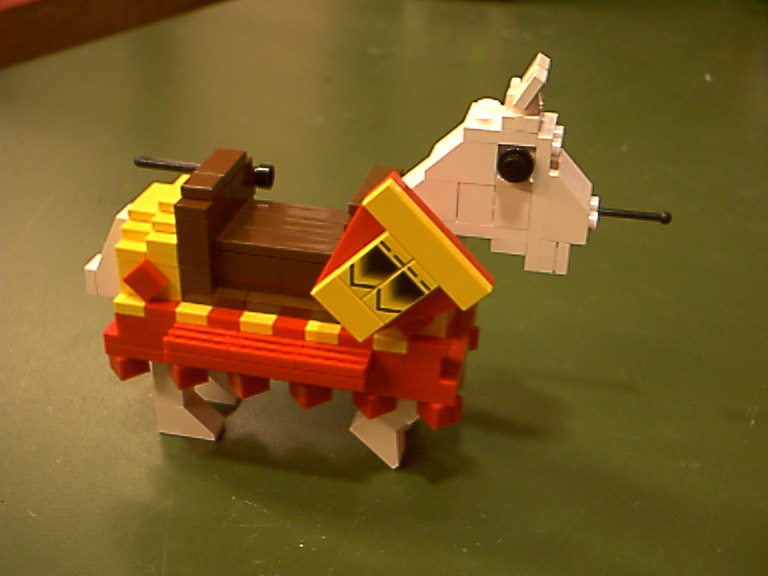 Both of the LEGO models were done what is called "double-up" style. This is when we emphasize the look of the LEGO bricks by doubling the size of a 1x1x1 brick to a 2x2x2 brick essentially. It is the LEGO sculptural equivalent to the pixelization of a digital image upon enlarging it. It looks chunky and too blocky in my honest opinion; although it doues have its place it some situations. I created many "LEGO doodles" during my many years at LEGOLAND (during my ten-minute breaks, of course), which started with my LEGO Eggo waffle. I had heard that phrase so many times in my life, I figured I would finally just LEGO and Eggo - literally. About six months after I was hired as a LEGOLAND California Model Associate (I was also an "MC" - or "Model Citizen" - as LEGOLAND employees are called), a full-time Master Model Builder position came open! It was like a LEGO miracle. Usually a person had to wait for someone to die or get abducted by aliens for one of these coveted positions to open up. I was determined to get this position and I did! So I was now officially, Eric Hunter, a professional LEGO Master Model Builder. Wow. I couldn't believe it. The next big project coming down the line at LEGOLAND California was the replacement of the New England harbor cluster. 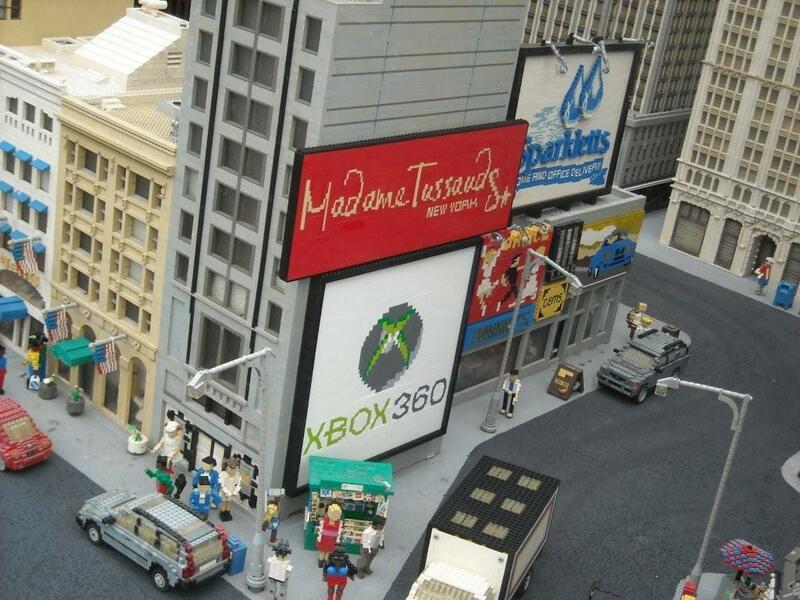 LEGOLAND Miniland Las Vegas was chosen to be the city to replace the harbor area. I was assigned two hotels to design and project manage to completion: The New York, NY and The Excalibur. Two fantastic architectural icons in the heart of Las Vegas, Nevada. The LEGO design to complete the New York, NY was crazy! 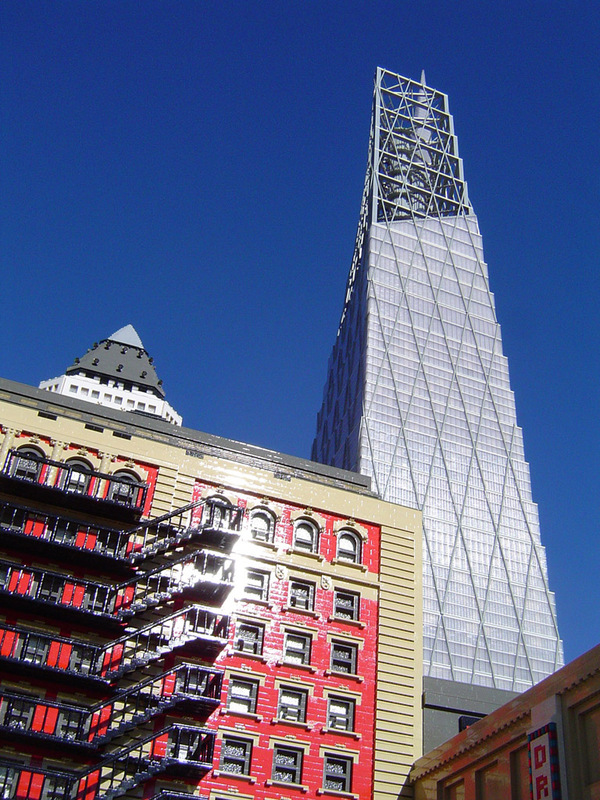 The building has 39 different building facades that come together to make the skyline look. It was a huge amount of LEGO design work and LEGO project coordination to complete. The LEGO Excalibur Hotel model I designed was similarly difficult in the way that it had a variety of 26 different castle turret styles to design out of square LEGO bricks and plates. It was a very challenging project. I love being a LEGO designer. The road to becoming a freelance professional LEGO artist is a fun one! As a LEGO professional artist, conventions and trade shows are a great place to show your skills. Retail store openings and events are a lot of fun, too. I mostly love doing LEGO commissions. Custom commissioned LEGO artwork for an individual, a family or a company is usually a more personalized LEGO model. I built (not designed) 100 of these if I remember correctly. It was my very first project at my new job as an "Associate" in the LEGOLAND Model Shop. How exciting!? I helped build this behemoth. It's the original approved design of the Freedom Tower back in 2005. Made of LEGO, of course, and it is 28 feet tall. It has since been replaced with the design of the actual Freedom Tower in NYC. This was my official first design at LEGOLAND California! It's a small version of the Joust Horse ride at the LEGOLAND theme park. © 2003-2018 Jonathan Eric Hunter DBA The Art of LeGogh.